Every state across the country claims to have the best pizza joint. It turns out that Virginia IS actually home to some of the very best. From Nutella pizza (yes, you read that right!) 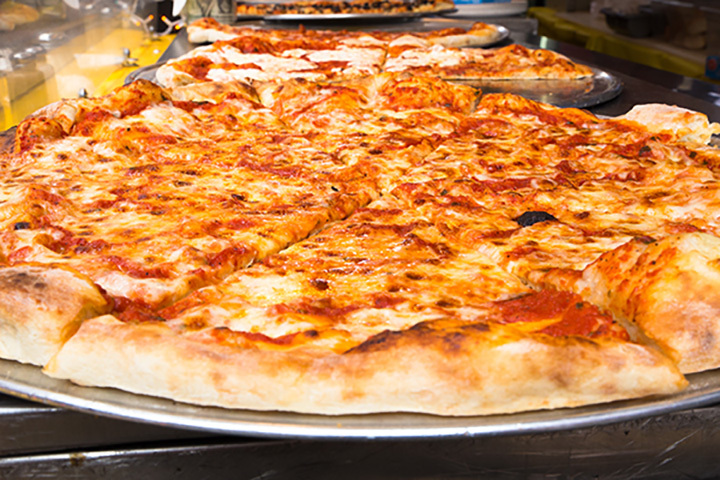 to 28-inch monster specials, pizza lovers will find plenty to chow down on in the Commonwealth. Let the cheesiness commence! Last year’s “Best Pizza” winner as voted on by Yelp! users is Rocco’s Pizza in Leesburg, Virginia. Yelper Vivky L. says, “If you love authentic pizza—not something from a chain—then you’ll be very happy here. A thin, chewy crust, cheese that is drippy and gooey (in a very good way), and sauce that hits all the right notes.” Hand me a slice. One can’t order pizza in Norfolk, Virginia, without at least considering Regino’s, winner of last year’s Virginian Pilot taste test. Regino’s has served pizza and other Italian favorites since 1948, and although the building has changed, their flavors remain authentic and delicious. One bite and you’ll be coming back for more. Salvatore’s Pizza in Virginia Beach, Virginia, is known for their huge, Sicilian-style pizzas and incredible garlic knots. The menu is comprised of authentic Italian favorites, including pasta and calzones. Perfect for date-night or family dinner with lots of interior seating and friendly service. Anna’s Brick Oven in Williamsburg, Virginia, offers a warm, familial atmosphere directly from Italy. Anna and her brother Sal Liguria, the owners, opened Anna’s in 1974 after moving to Virginia from New York, where Anna ran other Italian restaurants. Since then, they’ve continued to serve delicious Italian dishes, welcoming new and old customers alike as if they are part of the family. Crozet Pizza, established in 1977, is a two-seater in the little town of Crozet near Charlottesville (where a second location has recently opened). For the last 30 years, Crozet Pizza has focused on baking the best pizza possible, and has been recognized by “National Geographic” with the “Best in World” award, Foder’s Travel Guide “Best in State” and “Best in USA” accolades, and as a “Destination Restaurant” by The Washington Post. The pizzas are unique, the toppings varied, and the taste, remarkable. Chef Carmine Marzano and his daughter Elena Pouchelon have taken their combined six decades of hospitality experience to the next level in Osteria Marzano. While Mrs. Pouchelon worked with architects and designers to create their dream restaurant, complete with a granite bar, walnut accent walls, and golden whirlwind fabric ceiling panels, Chef Marzano brings his Italian heritage to bore in this D.C.-area favorite. Their handmade pastas, pizzas, and breads are incredible takes on Italian classics, but their dessert pizza is regionally renown. The two-person Nutella pizza has pistachio, sea salt, whipped mascarpone, baby marshmallows, and, of course, Nutella. Do you watch “Top Chef?” If you do, then you’ll remember the charismatic season four and All-Star contestant Spike Mendelsohn. Then you’ll need to try his pizza. We, The Pizza is one of Mendelsohn’s restaurants, and by all accounts, it’s “Top Chef” good. Each pie comes in slices, medium or large. The Cast Iron pies are delicious, and well worth the trip, even if you aren’t a Top Chef fan. Fire Works Wood Fired Pizza in Arlington and Leesburg offers pizzas baked in a five-ton wood fired oven. It was the 2014 Best Business of the Year award recipient from the Arlington Chamber of Commerce. Sixteen different pizzas adorn the menu, along with a create-your-own option and gluten free add-ons. Options range from the traditional Cheese & Herb pizza to the more adventure Black Sheep pizza, which includes feta, lamb sausage, and a balsamic glaze. Waterstone Pizza in Lynchburg, Virginia, offers fire-roasted pizzas, pastas, and sandwiches in an urban loft. Waterstone has a hip character to it, and a sly coolness that makes you want to spend time at one of the booths. Pizza enthusiast favorites are on the menu next to the blackened shrimp and mango pizza, which includes ginger sauce, mango, and scallions. If you’re not feeling adventurous enough for a spicy Thai pizza, fear not: The barbeque chicken, margarita, and garden pizzas are perfect for you. Benny’s boastful slogan is “Home of the Virginia Slice,” and in this case, it’s apt with locations in Blacksburg, Roanoke, Radford, Harrisonburg, Smith Mountain Lake, Charlottesville, Fredericksburg, and Lynchburg, it’s likely any college student has had a taste of Benny’s. The 28-inch pizza is their signature pie. The pizzas are so big that there’s even a Benny’s Challenge, in which contestants can win $500 for eating a special “Challenge Pizza” in 15 minutes (if you’re considered a “competitive eater”) or one hour (for amateurs). Check your local Benny’s branch for the monthly special, and don’t forget they’re open until 3 a.m. on weekends — perfect timing for those late-night Saturday “study” sessions.